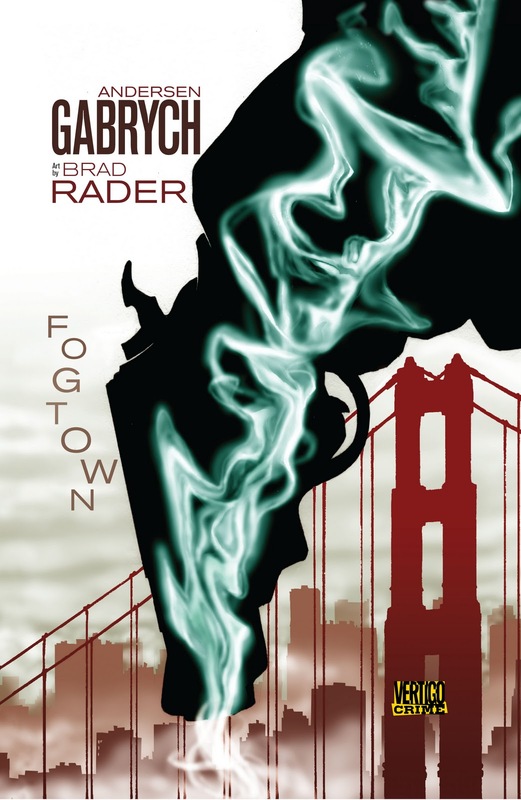 Fogtown, by writer Anderson Gabrych and artist Brad Rader, is one in a series of digest-size, hardcover, black-and-white graphic novels being produced by Vertigo Crime, a subdivision of DC Comics’ Vertigo line of edgy comics (such as Hellblazer, filmed as Constantine, and Sweet Tooth, about a kid with antlers and no navel in a post-plague America). Full disclosure: A few years ago I wrote a private-eye mini-series for DC/Vertigo called Angeltown (now collected as one book, with new added material, and due out in March from Moonstone as Angeltown: The Nate Hollis Investigations). I also have an original graphic novel, Cowboys (with art by the talented Brian Hurtt), coming from Vertigo’s crime line in July 2011. That said, rest assured that I don’t get a cut off of Fogtown’s sales, so trust me here. I really dug the story and art in this book. It’s set in 1953 San Francisco and the set-up is familiar: à la Jack the Ripper, a madman is gutting prostitutes in the city’s Tenderloin district as the fog rolls in heavy and menacing off the bay. Tougher than a West Texas boot, middle-aged private eye Frank Grissel gets immersed in finding out who this murderer is, while Gabrych and Rader give us a look and feel of ’50s Bay Area Americana. Grissel intentionally comes off as a riff on Mickey Spillane’s Mike Hammer with an extra dose of testosterone. But the joy of this graphic novel is how Gabrych offers distractions and diversions as the secrets of the case and Grissel’s life are revealed. If you remember from the first Hammer novel, I, the Jury (1947), there was this head-shrinking, ball-busting psychiatrist-villain, Dr. Charlotte Manning. Gabrych sends her and several other tough-guy ’50s paperback-original troupes out for a new spin in this story. Rader’s somewhat cartoony style is not an approach I usually respond to, but it works here, given the bluntness of the tale and its characters. Think Robert Aldrich’s treatment of Spillane’s material in Kiss Me Deadly (1955). Fogtown is a graphic novel well worth the price of admission. Movie star Alan Ladd led the cast of the syndicated half-hour series Box 13, which ran for 52 episodes over a year on the radio (1948 to 1949). He played Dan Holiday, a reporter turned novelist, who was constantly in search of ideas for his future books (a concept not dissimilar from that of the current ABC-TV series Castle). Holiday ran an advertisement in the classified section of the newspaper he used to work for, which read: “Adventure wanted! Will go anywhere, do anything. Write Box 13, c/o Star-Times.” Holiday would invariably be contacted by all sorts of people and fall into various oddball and dangerous adventures. In this year’s Box 13 graphic novel, by writer David Gallaher and artist Steve Ellis, Dan Holiday has become a spy novelist, who also has done a non-fiction book about mind-control programs such as MK-ULTRA, conducted by the CIA in the mid-20th century. Somebody named Suzie (which was the name of Holiday’s secretary in the radio show) has been leaving this Holiday small wooden boxes with numbers on their lids, beginning with 1. Every time Holiday opens one of these boxes, lights and funny symbols float up out of it (shades of the atomic light in the trunk in Kiss Me Deadly that Quentin Tarantino paid homage to in Pulp Fiction) and something haywire is trigged inside of him. Holiday’s eyes go red, a gray streak appears in his hair, and suddenly the mild-mannered writer can leap from a car roof onto a building’s fire escape and shoot a pistol better than the Punisher. Then there’s the alluring and mysterious Olivia Mayfair (her last name being the same as that of Ladd’s production company, which was behind his radio show) ... But I shall say no more about her. Holiday also has these peculiar blackout spells, from which he wakes up in locations such as the East River and a hospital ward straight out of a Terry Gilliam flick. While this printed version of Box 13 was published in early 2010, the original story ran as a serial Webcomic for the iPhone from ComiXology.com back in 2009. Each chapter break is designed to end on a cliffhanger, so the reader will come back for more. Gallaher does an excellent job of pacing and characterization, but he could have taken the time to do some re-engineering of the ending for the print version. Although it’s meant to be ambiguous, it is a bit too fuzzy and not as coherent as it could be. Ellis’ artwork has a kind of loose-limbed style that grew on me, and the way he draws facial expressions is well-suited to the creeping, sweating paranoia of Box 13. Matters go further downhill from there, and soon our girl winds up underneath a wrecked Mercedes-Benz as her erstwhile lover sets its leaking pool of gas on fire and leaves her to die--’cause she’s just too much goddamn trouble. Only she doesn’t actually cash in her chips, and in the days after the hurricane lays waste to that blue city in the red state of Louisiana, Nola cuts a vicious swath, exacting vengeance upon the man who wronged her, while along the way she resurrects a past involving her long-gone daddy and secrets best left undisturbed. There is a bit too much coincidence of plot in Nola. But I liked that its elliptical structure--parts of the story come from the immediate past, then the action loops to the present, then back again--echoed the 1967 motion picture Point Blank (adapted from Donald E. Westlake/Richard Stark’s novel The Hunter) as well as 1999’s The Limey (which consciously borrowed from that previous film). Nola bears a rough-hewn character that comes across both in its dialogue and in Couceiro’s unadorned art, which ain’t pretty, but is certainly suitable in establishing this story’s verisimilitude. Colorist Juan Manual Tumburus earns an honorable mention for his earthy, muddy palate, which aptly conveys Nola’s post-deluge New Orleans. Let me say straight away that I am extremely jealous of writer, artist, and cartoonist Darwyn Cooke. The reason I became an author, trying to paint pictures with words, was due to my inability to draw. When I was a kid, there was nothing more I wanted to do than to write and illustrate my own comics. 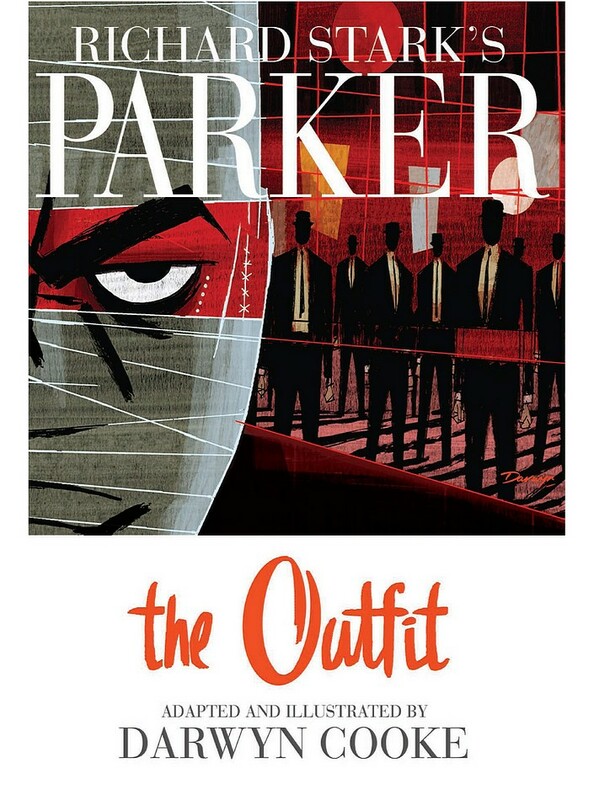 Anyway, this adaptation of Westlake/Stark’s The Outfit (1963), the third novel featuring the non-hero and thief known only as Parker, is the second such venture the talented Mr. Cooke has undertaken. Last year he gave us his take on the first Parker novel, The Hunter, set in 1962 New York, just as the original book was. The Outfit opens in Miami Beach, Florida, in 1963, with a nice allusion to a scene from The Hunter, in which Parker is shot in bed by his girlfriend after they’ve made love. Cooke’s Outfit likewise begins in the boudoir. A down-angled full-page panel shows a woman, Bett, in bed looking aghast after the pillow next to her is hit by a silenced bullet. The words read: “When the woman screamed, Parker awoke and rolled off the bed.” Parker, however, is not visible on this page. Picking up here on the lean prose of the Parker books, Cooke uses short-hand dialogue and blocks of expositional text, which are not often employed in comics. His color palette is limited to black lines, solid blacks, and grayish-purple tones. (In 2009’s Parker: The Hunter, his tone was, instead, a grayish-green.) Cooke’s style of anatomy (which clearly evidences his background in cartoon storyboarding) is not everybody’s cup of bourbon, but I think he does a bang-up job of evoking the look and feel of his yarn’s time period and conveying Parker’s cold anger. For my money, he does the memory and work of Mr. Westlake proud. SO WHAT DO YOU THINK? Those of us at The Rap Sheet are curious to know whether readers of crime, mystery, and thriller novels are also attracted to graphic books that tell similar stories. If you haven’t tried out graphic novels in the crime and mystery field before, has the above sampling encouraged you to do so? Are retailers such as the Mystery Bookstore and Book Soup in Los Angeles smart to include graphic novels among their stock, or are the audiences for these two media non-overlapping? We encourage you to share your responses to these questions in the Comments section of this post. 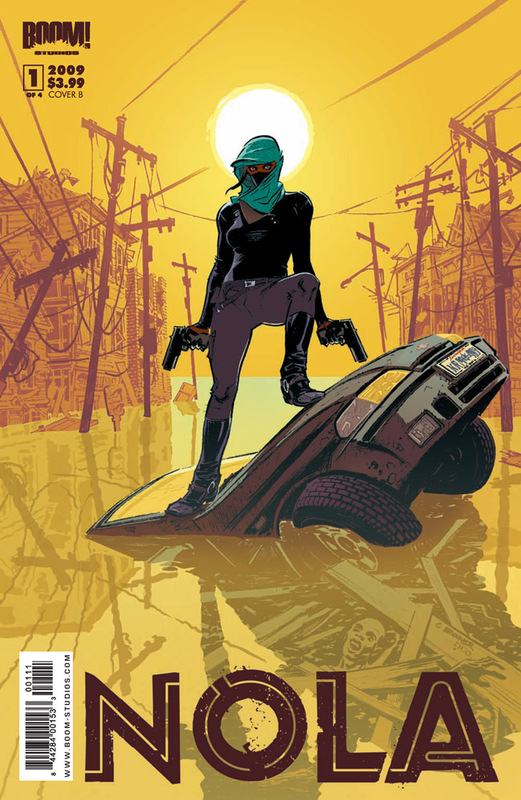 READ MORE: “The Fall (and Rise) of the Crime Comic,” by Brian Lindemuth (Mulholland Books). LITTLE BROTHER, FOR THE WIN and virtually anything else by my hero, Cory Doctorow of Boing Boing, who turns the YA genre on its head. Thank you for the review of BOX 13. We continue the story in new serialized digital comics, BOX 13: THE PANDORA PROCESS. Thank you for your review. We continue the adventure in BOX 13: THE PANDORA PROCESS, which is currently being serialized and should see print next year. Gary, you're reading my mind on this one. I'm just back from my local comic shop, where I bought Volume I of Sin City today. OK, that's a golden oldie by now, but I also know that 100 Bullets and, especially, Scalped are some of the best noir in recent years and that the Jacques Tardi/Jean-Patrick Manchette West Coast Blues is one of the most brilliant cross-medium adaptations I know of. And I liked Darwyn Cooke's Outfit better than I liked his Hunter. I don't know if the audiences for the two media of comics and crime novels overlap, but they damned well should. I'm encouraged that you and Brian Lindenmuth and Jon Jordan and others are working toward that end. 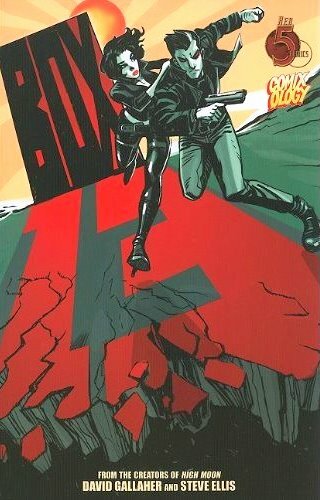 Ever since my man Jim Steranko did "Red Tides" a thousand years ago, I've been a fan of crime comics. Thank you for this wonderful wrap-up. Since I haven't read ANY of these, looks like I have some work to do. A fascinating overview. It would be great to see some of my favorite crime fiction titles given the graphic novel treatment, including Phillips' The Jook.